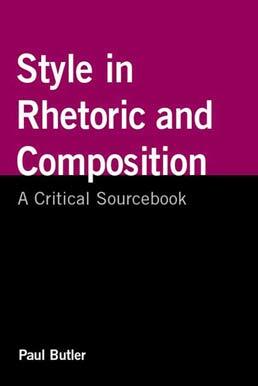 Addressing a range of issues that includes grammar in style, sentence-based pedagogies, imitation, and alternative rhetorics, Style in Rhetoric and Composition traces the evolution of the study of style. The text also highlights the debtates which continue to shape style pedagogies within the field of rhetoric and composition. Paul Butler is an assistant professor in the Department of English at the University of Houston, where he teaches undergraduate writing classes and graduate courses in a new PhD concentration, rhetoric, composition, and pedagogy. Butler's book, Out of Style: Reanimating Stylistic Study in Composition and Rhetoric, was published by Utah State University Press in 2008. His work also appeared in several journals, including JAC, Rhetoric Review, QPA, and Reflections, and in an edited collection, Authorship in Composition Studies.